Perfect pool safety solution for the frequent swimmer ! 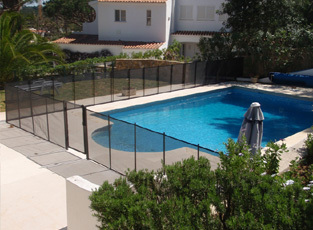 Our sturdy, lightweight pool fencing, which is held in place by concentric tension, can be installed and removed in minutes. Installation of this swimming pool fencing requires professional installation by drilling of 20cm holes in concrete deck or other surfaces where pool fencing is desired. Sleeves to support the pool fencing poles are inserted in the holes. These holes are come with plugs when the swimming pool fencing is not in use. To remove, one releases the tension and lifts up on the first pole. The swimming pool fencing is then rolled to the 2nd pole, which is lifted and rolled to the 3rd and so on. 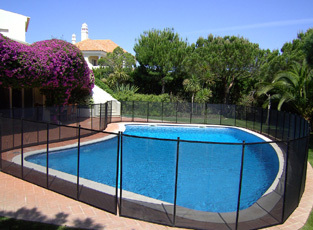 Removable swimming pool fencing can usually be installed around irregular shapes and over varied surfaces and elevations. 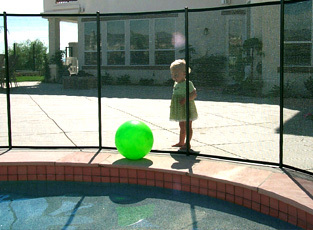 Due to the unobtrusive, transparent nature of pool fencing, most pool owners rarely remove this safety barrier. The fence panels are 1.22m high, (current legislation requires 1.10m in France) Each panel is 4.27m long and within that is contained 5 panels that are each 838cm long.